Italians have made and enjoyed gnocchi since ancient Roman times. The major difference is Roman gnocchi were made using wheat semolina since potatoes were not introduced to Europe until the 16th century. 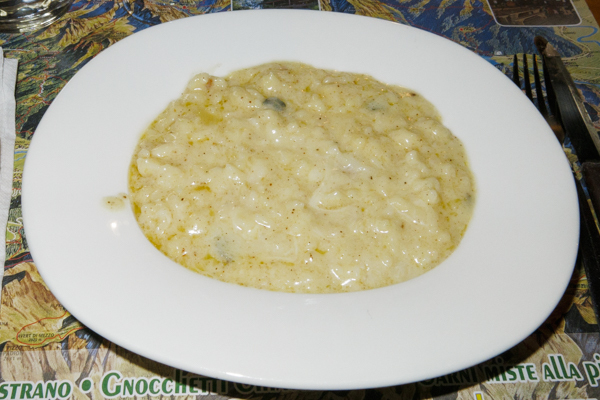 Today, most prepared (dried or frozen) and restaurant gnocchi are made using potatoes as the main ingredient. Spinach, ricotta or other ingredients can be added for variety. One advantage of homemade gnocchi, unlike homemade pasta, is you do not need a machine or any special equipment to make them. One disadvantage, is home cooks can add too much flour resulting in tough, chewy gnocchi that is more like store bought gnocchi. Correctly made gnocchi is light and melts in your mouth. If your gnocchi turns out a little tough, it is not a disaster and not uncommon. Most prepared and restaurant gnocchi are tough compared to the homemade gnocchi I grew up with. Next time, try making the dough using less flour. Commercial and restaurant gnocchi have a uniform shape and size. If you want to invest hours making uniform gnocchi, be my guest. Rustic, homemade gnocchi will vary in shape and size. Ideally, try to maintain a uniform thickness to assure uniform cooking. There are several ways to form gnocchi. The simplest is rolling out the dough and cutting into 3/4 to 1-inch lengths. Each piece can then be rolled over a fork tines to form ridges like the store bought gnocchi above. Some Italian cook books form ridges on one side and press a finger into the other side forming an indentation to reduce cooking time. My mother used her 1st and 2nd fingers to press and roll each piece on a surface dusted with flour. This method takes practice and produces the gnocchi in the photo below. 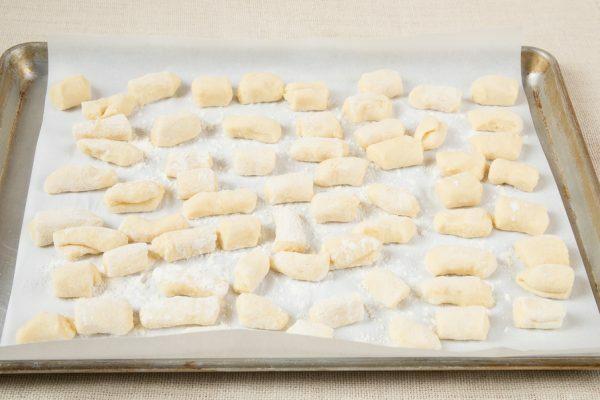 The easiest way to transfer gnocchi to cooking water is using a clean cloth or parchment paper dusted with flour. You can also use a large baking sheet to make transferring your gnocchi from your work surface to your pot of boiling water easier. Like cooking fresh pasta, fresh gnocchi cooks in a matter of minutes. 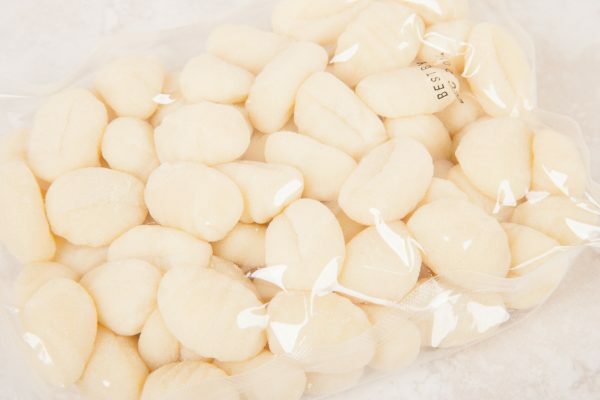 Uncooked gnocchi will fall to the bottom of the pot when as soon as they are added to boiling water. Gnocchi are cooked when they float to the surface. Yukon Gold, Red and White Rose potatoes work best. Cooked Russet potatoes can absorb water requiring too much flour to produce the dough. Homemade gnocchi can be fragile. To reduce breakage, use slotted spoon or wire strainer to transfer cooked gnocchi to serving plates. Rinse potatoes and place in a pan large enough to cover potatoes with at least 1-inch of water. Place, covered on high heat until water comes to a boil. Reduce heat and simmer 30 to 45 minutes or until potatoes are easily pierced by a fork or knife. Drain water and add cold water to cool the potatoes. 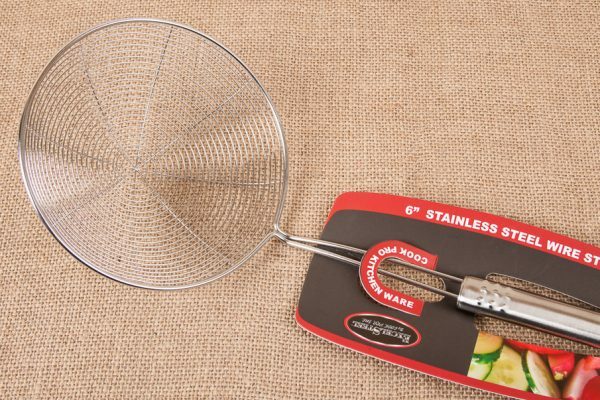 When potatoes are cool enough to handle, remove the skins and mash using a ricer, masher, or hand mixer until smooth and lump free. Dust your work surface with about a 1/4 cup of flour. Add the mashed potatoes and begin to work the flour into the potatoes using one or both hands. Make a well and add the egg. Beat the egg using a fork. Begin working the egg into the potato mixture and add the remaining flour. Combine, like kneading dough, to for a stiff dough adding more flour if necessary. The dough is ready when it is no longer sticky. Divide dough into 4 or more parts using a sharp knife or scraper. Roll each piece to about 3/4-inch thick. Cut into pieces 3/4 to 1-inch long using your knife or scraper. You can cook the gnocchi as is, roll each piece across the tines of a fork to make ridges, use two fingers to make an indentation and roll each piece into a cylinder. Bring at least 1-gallon of water to a rolling boil on high heat. Add about a tablespoon of salt if desired. Add the gnocchi and cook until gnocchi float to the surface. Transfer cooked gnocchi using a strainer or slotted spoon to serving dishes and serve with your favorite sauce.